When I was a kid, my mom took my sister and me to different farms to pick all kinds of fruits and vegetables. At the time, this was not a family outing I appreciated. I was born and raised in the city, and the idea of crawling around in the dirt to dig up food was not my idea of fun. Every summer without fail, we were knee deep in collard greens, bell peppers and green beans. And picking peaches was the worst! I learned quickly that snakes REALLY like peaches. I was 9-years-old, and he was 9-feet long. I dropped my basket and spent the rest of the morning sitting in a hot car. Needless to say, farming was traumatic for me. Now that I’m an adult and a vendor at the Matthews Community Farmers Market, I have a profound appreciation for the work farmers do to feed me and my family. There’s something inspiring about people who cultivate tiny seeds into enormous crops. I’m fortunate to have the opportunity to spend my Saturdays in the company of some really cool area farmers. Each week I learn something new about the latest crops, and I get to leave the market with a basket filled with fresh produce. As a mother, I understand why my mom wanted her children to know where our food came from and to take part in harvesting that food. I’ve also dragged my kids to fields and orchards to pick fruits and vegetables, and they actually enjoyed the experience once they got into the process—more so than I ever did at their age. Picking fruits and vegetables is fun for me now, but as soon as I see a snake I’m out! This recipe is an easy-assemble dinner with a variety of vegetables. 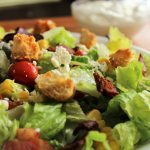 Most of the ingredients can be found at your local farmers market, and depending on the market, you might be able to get the bacon, eggs, bread, and blue cheese for the salad. Let me know when you make this recipe. 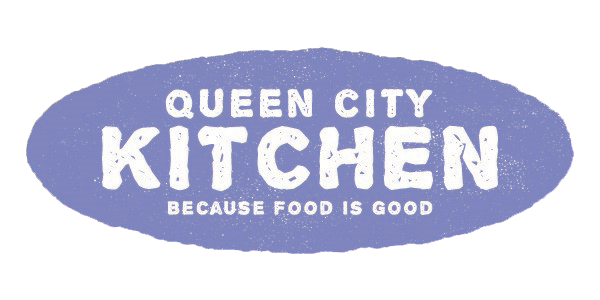 Take a picture and share a picture on Instagram with the hashtag it #QUEENCITYKITCHEN. I can’t wait to see what you post! Cook the bacon in a medium skillet over medium heat until crisp, about 10 minutes, stirring frequently. Use a slotted spoon to transfer the bacon to a paper-towel-lined plate to drain. Bring a large pot of water to a boil. Place the corn in the pot and boil for 5 minutes. Transfer the corn to a large bowl of ice water to stop the cooking process. Drain and set aside. 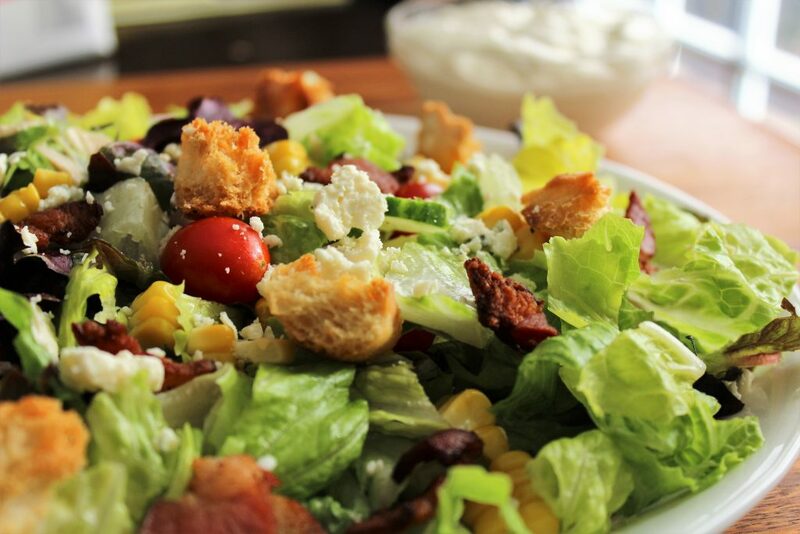 Add the lettuce to a large bowl, top with bacon, corn, cucumber, bell pepper, onion, tomatoes, eggs, chicken, and croutons. Whisk the mayonnaise, sour cream, ¼ cup blue cheese, buttermilk, lemon juice, mustard, Worcestershire sauce, salt, and pepper until smooth. Stir in the remaining ¼ cup blue cheese. Spoon some of the dressing over the salad and toss to combine. Divide the salad among 4 plates and serve. This entry was posted in 30-Minute Meals, Dinner, Recipes, Salad, Vegetable and tagged chicken. croutons, corn, fresh produce, lettuce, salad, vegetables on August 15, 2017 by Andria Gaskins.